The world is the same as the one outside of the window. It is dangerous, unsettling, boring and joyous, in all familiar ways. Leave the wilderness to the wild. What isn't touched by humanity exists at natural equilibrium and has no use. Look instead at created places: what was built, inhabited, used and abandoned, then torn down and rebuilt into a new form. Zoom in and look: here are the cities, the streets, the buildings, the rooms. Zoom out, observe: the rooms change functions and interior, the buildings are torn down and reshaped, the streets change names, curves and connections, and the cities are roiling landscape of impermanence through time. Created places are a touch of chaos. Look further, at places off the trotted paths, just out of everyday focus, just on the edge of awareness or of need: a condemned building, a hospital room, a police station, a service area in subway network, for-rent apartment that doesn’t attract a lot of tenants, a house with sordid history waiting to be resold, hotels, maintenance floors, boring conference halls that are inhabited only for occasion. Look at the places people don’t want to be in or cannot stay in. Look carefully: in the condemned building for the least stable piece of floor, in ugly for-rent apartment for the most hopeless spot, in the conference hall for the most dull and suffocating room, and in sordid house for the place where bloodstains where sanded off and covered in pastel paint. Some of such rooms experience a supernatural mitosis. When it happens, two rooms come to exist in the same time, overlapped, almost the same: the second is just slightly even more out of focus, just slightly out of touch, just slightly further away from the prime world. Wrong step, off glance, a play of shadows, a particular state of mind – people step from one room into another and back without even realizing, between thoughts, between seconds. The second room, the doppelganger, is almost the same, after all, it isn't easy to tell the difference at the quick glance. There is a feeling of false deja vu or of occasional surprise. Something nagging on the back of the mind, some hair-raising animal instinct of "how it should be but isn't" – but the eyes refuse to focus, and the mind to process anything except the mundane. Some items are in different places, some are missing entirely, some that were destroyed, discarded or hidden, are occasionally present, and the air is somewhat stiffer to breath. There are tiny black spots in the eyesight, the self-censoring mind. There is always a self-given explanation why the knife is on the other table. Other than discomfort, the doppelganger presents no danger aside of what initial room might have on its own. Usually a simple subconscious desire to get back to normalcy is enough to step out, back to normalcy. It is necessary to utterly suppress this instinct. It is necessary to linger to make process. Because there always going to be another door in the doppelganger, the one that doesn’t exist in the world. Look for it behind the wallpaper and pastel paint, behind bookshelves, behind floorboards. Just as everything else, it is slightly off focus, out of touch, out of way of the obvious. Find it. Find a key for it. Open it. There will be another room or a suit of rooms behind the Doppelganger Door, and there will be another door somewhere there. It is a sequence, a path. Each of subsequent rooms is more and more off than the one before it. At first these rooms seem to go into the past, as if stepping backward through the recording – bulky radios, gramophones, gas lamps, heavy curtains, the shells of doppelgangers that no longer exist – but they quickly become distorted, then twisted, then alien. Bright green metals and azure-hued plants. The pale sunlight through black windows that cannot be open. The cold glass that flows like water. It is a gradual change, it is a gradient, a sequence, a path, a bridge, a connecting tissue of rooms-cells between the prime world and the Otherside. One world weakens, another grows stronger, room after room after room. Interiors get bigger, sprawl into floors, multiply, start to echo, turn back into themselves, grow into labyrinth connected by illogical paths. Laws of the prime world and the influence of the Otherwise mix. There is no sense of hunger and it is impossible to fall asleep, but there is still starvation and sleep deprivation. Wounds that would be lethal leave only pain but the pain crystallizes on the skin like jewellery and then kills. There is no aging, but in sprawling labyrinths of amber light and white stone there are monsters who speak old human words and wear old human faces. It is a long path and it is easy to get lost: rooms often open sideways, into other rooms, not getting any further away or any closer. It is important to find a right door. It is important to come prepared. Before the Oracle Threshold it is still important to mark the way back. Not everybody is capable to come back. – the potency of and for supernatural and magic. (0) – bystander shouldn't be there but here anyway by chance, by accident, by joke, as a herded pawn or by a blind friendship. Fish out of water, most of them are here for the first and the last time. (1) – misfit is unwanted in the prime world. Odd or desperate, they have nowhere else to go. It is quiet in the rooms nearby and almost homely. (2) – skimmer is here for profit, or thrills, or both. Many useful things lie unclaimed in the rooms, and there are no restrictions on any kind of hunt. (3) – occultist tasted mysteries, and mundane world can no longer satisfy this hunger. (4) – the driven has a goal that cannot be fulfilled by usual means. Be it a vengeance against untouchably powerful, a burning ambition, an impossible cure – every other way to achieve it in mundane world had failed, so the only path remaining is supernatural. (5) – the haunted is a meat puppet, a battlefield of a struggling human mind against a howling specter of the past. Few of the haunted achieve some measure of co-existence with their riders, and these don’t come close to the rooms. The rest are pushed, dragged, shoved and mentally whipped into going deeper to pursue goals that aren't their own. (6) – the entombed in their own mind and body, they long for the final apotheosis. – To take refuge from the world. – It is somewhat alike to urban exploration. – The doppelganger room and adjacent rooms have a lot of items that can be sold for profit – from duplicates of mundane valuables, to vintage things that aren't too twisted. – There is a market for oddities and occult materials from the farther rooms as well. – It is possible to move through nearby rooms from one doppelganger room to another doppelganger room far away. Such 'shortcuts' are dangerous but usually are faster than regular travel and under radar of border services. – What can be called spells can be brought back to the prime world and used there. – Influence of the Otherside makes many impossible things possible within the rooms and those changes stick. I was always wondering why when I see Veil, Membrane and other such things that separates This World from Things Beyond is almost always on/off barrier like a wall (monsters come through it, it has to be enforced, can be breached, etc) and it is never explored on its own, as a bridge between realms. At best there is some vague in-between realm, such as Gauntlet or Fade or Weave of Phase Spiders, that mixes both sides, but there is almost no sense of gradual movement toward one or another side. Rooms suppose to use (modified) Depth mechanic from Emmy Allen's The Gardens of Ynn and The Stygian Library. I think that Depth (and its spiritual predecessor, Chaos Index) is one of the most elegant and adaptable mechanics made in recent years. I hope I can somewhat expand on it. Peter Webb gave me idea about mitosis of world; this idea dragged many interesting things with it. Aesthetically Rooms are somewhat inspired by puzzle game The Room (1, 2 and 3) and some hidden object games. If to speak about 'shadow settings', HOGs on one hand are utterly trite, saccharine and predictable, and on another, have some strikingly good small ideas or visual elements, like a tower that holds the world from collapsing and builds its floors from the psyche of people sacrificed to it. Also Rooms are from memories of traveling forty floors of technical levels, seeing all those bricked off doors, and weird graffiti, and somebody's footprints on a ceiling. On one hand it is clearly a prank, but on another, it is a narrow grey stairwell with metal railing, naked lamps, the wind that can audibly be heard through the thickness of the building and nobody else around. I like strange labyrinthine places, among other things. Godbox (of Gheste) is a good way but Rooms has more grounded approach. I hope I can finish it one day. If I do the next post will be less intro and more about drifts (classes). In a certain world, of three established practices of magic the Grand Tradition, the Glorious Art is the oldest. For almost a thousand years since barbaric conquerors of the Jeweled Lands settled as kings and forgot their own savage ways, this magic was the dominant method of enchantment, and, for the longest time, the only way. Called 'the sorcery of kings', for most of its time it served rulers and wealthy patrons, as Grand Tradition was expensive to learn and even more expensive to practice, taking years of life and rare ingredients to learn, master and create works. It wasn't uncommon for such sorcerers to be home-grown in a noble house or under a life-long patronage of a particular sovereign. This magic was slow, almost methodical, and created in layers – from the simple and intangible framework of first stage enchantment into a solid, mindbogglingly complicated interlock of elements, the weave so complex that every single part of it couldn't be comprehended alone. The complex nature of Glorious Art is self-sustaining, and due how it blends and flows within itself in closed loops and structures, it is almost eternal and almost impenetrable to any subtle changes. The works of Grand Tradition take months to years to make but last for many centuries unless directly and purposefully broken by a brute overwhelming force. Even if the magic of the enchantment never fully settles, the movement of its compound elements is so slow that is is not perceivable by human eyes, although long-lived varra watch such movement within particular works of magic, and discuss the aesthetics of these motions. The process of creating the enchantments of Glorious Art (in addition to being slow, complex and expensive) is also the most dangerous of all three – even if the finished enchantment has no negative effects and presents no danger other than it is made to do, the raw ingredients of it and magic in process should be kept under strict care so they won't spontaneously and violently react to each other while still untamed. Aside of its longevity, the benefit of Grand Tradition is how natural it appears. Artificial people, the long-established pride of this practice, look and behave almost entirely like real people, up to having real-like memories and believing themselves real people; the buildings or sites built of such enchantments are as stable and real as any built by hands of man, despite their often fantastical appearance and no less fantastical laws that govern the interiors. The second magic, the Messenger, is nothing like the Grand Tradition. It is flimsy, fragile, fast to work and entirely unnatural to behold. The conflicting legends of its origin tell of either cunning noblewomen of Jaharra, who were forbidden to practice Grand Art but found a way to do something else, or impoverished students of Teronna University, practicing with leftover, trashed ingredients of Glorious Tradition to save money. The initial stigma of being frivolous fancy or only for the poor, and thus neither proper, nor serious, nor worthy of respect, still very faintly lingers with the Messenger, despite how much it is widespread today, how much use it finds everywhere and how much it became appreciated through last two centuries since it was discovered. True to its name, the main advantages of the Messenger are the quickness (most works take bare minutes to make, and even the most complex ones take a few days at most), the simplicity (middle complexity enchantments can be learnt in about a year, and, unlike in grandiose Grand Tradition, free-form nature of this magic makes even basic enchantments useful), the safety (unless the mage is extremely foolish or careless, and begs to be poisoned by their own negligence), and the compactness (as of all three practices the Messenger is still the only one that can be effectively practiced in any place without preparation as long as the mage has a bare minimum of small and portable tools). Enchantments of the Messenger cannot ever compare to the natural stability or complexity of the Glorious Art and are highly, strikingly unnatural to behold. They are also much smaller and more personal in scale – there are no fantastical buildings, such as Floating Castle of Yr, made with the Messenger, and many argue such enchantment would entirely impossible to do while many try to prove otherwise. The Messenger works are as fragile on any prolonged run as they are striking, so these spells are mostly used for the spur-of-the-moment needs such as the daring flight of Reva Edarri from Sogna to Garnaga that first brought this magic to the public eye. The preservation of Messenger enchantments takes almost as much, if not more, of effort as Glorious Art has to take about its untamed ingredients. There are people who find such conservation desirable for posterity; in the recent years the collection of such otherwise-gone-in-moment enchantments became a sign of prestige and wealth almost as much as patronage of Grand Tradition once was. The third practice called Shapeshifter – it is most recent innovation, barely half-century old, but it is the one that finally pushed Glorious Art into almost full obscurity. Both the Messenger and the Glorious Art coincidentally caused this discovery: the mages of the Messenger wished to improve the longevity of their works, and the mages of waning Grand Tradition felt threatened on their golden perch by the rising popularity of the Messenger and sought to work faster and with more variety of effects. The Shapeshifter can imitate effects from both older practices almost perfectly but with underlying character of its own process and very few drawbacks; its versatility is unmatched, as it can even blend the two approaches together and create some new effects entirely on its own. It can be as fast, and light, and simple, and striking as the Messenger; it can be layered, methodical complexity of Glorious Art, while being entirely stable, all while demanding much less preparations and time to learn or to make, and being much safer, cheaper and easier to upkeep. The Messenger still has an advantage of safety and portability; the Grand Tradition still has almost negligible edge on its natural-blending qualities which Shapeshifter can almost but not quite yet fully imitate, as seen with its artificial people. Shapeshifter demands slightly more time than the Messenger for the complex enchantments but for the quick works it is often so inhumanly fast that the mastery of its basics requires the mage either to be able to work with quick precision (lest the raw magic settles in a crooked form) or to use golden dust to slow the process. The main distinction of the Shapeshifter is its ingredients and tools. While the Messenger and the Grand Tradition share the same ingredients, albeit in a different forms, Shapeshiftering occult panoply has only appearance of the familiar things, and the first lesson the novice mage of Shapeshifter learns is how to transform, through the influence of otherworldly flux, the necessary instruments into an alien, more malleable forms. Unlike older two practices, where raw ingredients can be used through decades if cared for properly, Shapeshifter magic makes the changed materials became an inert rot if unused after a short time. What some people (mostly of hidebound, traditionalist views) also cite as a drawback is a growing tendency of last decade for Shapeshifter mages to create enchantments of decidedly incomprehensible and outworldy looks, which seemingly serve no aesthetic or practical purpose; the critics emphasize the obvious degradation of human mind Shapeshifter certainly cause. But even if such works became somewhat more widespread in recent years Shapeshifter mages seem to make them in their own spare time as a leisure, while competently producing more realistic enchantments. As such, those works are of little concern to the public eye, as Shapeshifter gained popularity that fully eclipsed Grand Tradition and is close first with the Messenger. It is basically, a long-winded answer to the question "what if the magic behaved like an actual art process?" Namely, Grand Tradition is oils, The Messenger is watercolours and Shapeshifter is acrylics. Despite my little practical experience with paints, I found fascinating how different are processes of using each kind of paint are. I am finding a parallel between art and magic to be an interesting one: in method both are very similar as both create almost infinite variety of effects, and there are several ways the art can be divided into 'traditions' - by medium, by scale, by art style, by the subject, just like magic tends to be divided into various schools, traditions and disciplines. Cubism is as strikingly different from other art styles as necromancy is different from all other magic traditions; a work in oils can be seen as memorization, watercolours or pencils as spontaneous. Unlike the magic, which always has immediate practical purpose (Spider Climb walls, Raise particular Dead) and, in RPGs, extremely rarely serves any impractical subjective purpose, the art by itself usually doesn't have much practical use – a picture could be used to cover a crack on the wall, for example, but any picture could be doing that, regardless of the actual art subject. The closest, I think, the art comes to the utter overwhelming practicality of magic, is illustration – i.e. non-subjective, complimentary, explanatory graphical reflection/portrayal of certain things and concepts that meant to be viewed with the same conclusions about the subjects shown. As such, practicality of an illustration almost serves as polar opposite to an actual art, where each viewer supposed to put an artwork though lenses of their own imagination, experience and perception and to come with their own interpretation of the subject. I don't mean that acrylic works are degrading: the view I took for this certain world is from old Soviet Union-based critique of Pollock's art and of similar art forms such as Cubism which at some point were viewed as objectively bad things, and Shapeshifter is an very new tradition in a world not used to new thoughts. I thought, though, it would be also interesting to imply that in this particular setting Shapeshifter is of alien origin, especially given that acrylics are polymer emulsion paints and are entirely different in their structure from oils or watercolours. Shapeshifter making Grand Tradition obscure is not as much about acrylics vs oils (although this too, heavy body acrylics can look remarkably like oils sometimes, while not as flammable and easier to dry) as about several articles I've read where people working in traditional portraits or landscapes techniques (i.e. what oils were doing for the long time) are heavily discouraged by both art teachers and galleries from doing so. What was once a pinnacle of portrait, a life-like replica of the actual person's face, is not often needed now as a picture when we have photography. From what I've read somewhere, oil paint never really fully dries, even after the centuries, hence Grand Tradition magic is always a bit moving. Don't know if it is true, as I never worked with oils long enough to make a painting. But turpentine-rag-caused fires can be very real, hence the danger of Glorious Art process. You can poison yourself with watercolours but it takes either 1) deliberate effort of eating a teaspoon of paint or persistent negligence of sucking on your brushes or 2) significant exposure to cadmium-, cobalt-, lead-based or old Victorian watercolours (where they put arsenic into everything for that brilliant green colour). The industry started to phase out cadmium from watercolours for safer paints, and lead-based watercolour are forbidden, to my knowledge, in Europe and Americas, as, obviously, arsenic. I imagine DnD mages being mostly the Messenger mages: quick, flashy and not very subtle effects, still a marvel, always capable to work in a moment, but not the ones that last for long. Throwing a fireball is like working wet-on-wet when paint just blooms. Not fully predictable nature of watercolours also justifies semi-randomness of many DnD spells - you get the effect you want, but not precisely the effect you want. Shapeshifter can, of course, imitate the free-flow effect (and also create big permanent works, i.e. magical items, unlike the Messenger which is incapable to do so), but to my knowledge, it is not possible to carry compact dry acrylics with you, while you can carry dry half-pans of watercolours basically in your pocket, which is why the Messenger is still most portable magic. On-a-go painting is possible for acrylics and oils but requires more bulky sets, more space, more tools and more preparations. Golden dust for slowing down Shapeshifter is a pun on Golden brand of acrylics that has many slow-dry mediums. Other brands have such mediums too, but I only have Goldens. Water-based oils do exist, so you can say that Grand Tradition is trying to keep up and modernize itself, but still, Glorious Art in this certain world desperately needs is own Bob Ross, the Smiling Wizard. It is unfair to speak about work-in-progress but Tenebrae by Unusual Existance is such interesting work that I wish to speak about it anyway. The initial G+ post brought to my attention thanks to Arturs Leitans's post about masks. Tenebrae was already compared to several things – Black Sun, and Dying Earth, and BLAME! (and I expect 'Veins of the Earth' and 'Into the Odd' to be mentioned at some point) – but where Black Sun is aggressive, inescapable despair, and Dying Earth is baroque cynical adventureland, and Blame is endless, mostly desolated, city, the Dungeon in Tenebrae stands on its own being none of these things. It is more hopeful than Black Sun, it is already in dead world, (so not really _Dying_ Earth), and, unlike in Blame!, instead of the city it is the literal underworld sewn with dead memories of the world's better and louder times made flesh. Whatever remained of the Last Empire clings to life in pocket stronghold(s) between the surface (that is grabbed by Void in an attempt to devour it) and the Dungeon of the afterlife (which patiently waits for the surface to let go, be devoured and pass on, probably resetting the world), and where living cannot travel without aging to a dust in about a minute. All those gnolls, and goblins, and beholders that PCs meet in the Dungeon are, from what I understand, already dead, and appear because the underworld relives the memories of its past when Masks and/or living people trigger those memories when they venture through. Masks are the most unique mechanic in Tenebrae, because in order to travel through the Dungeon ritualists-adventurers wear the mystical Masks of various mythical archetypes, Hero-of-Thousand-Faces style: the Dungeon and its dwellers see them existing as their Mask's archetype. Right now there are only four Masks (Zealot, Untamed, Arcanist and Knave) but at least one more non-PC mask is mentioned, and rules for swapping Masks are also here; I immediately wanted to add a sort of Jester or Sage masks, maybe combining them both into Madman. PC's identity in the Dungeon is not important: it isn't the PC that has HD, better AC and extra vitality able to withstand the underworld, it is the Mask. It isn't PC that levels up, it is the Mask. It isn't PC that gets all those powers, it is the Mask, and Masks can be swapped, and found, and, presumably, lost or ripped off, which, at the very least, is interesting because it makes PCs so vulnerable. The second most unusual thing is how Tenebrae handles gold. With sun, and moon, and stars devoured by the Void and officially out, gold coins in this setting are mystical nodes of power, light and essence, encapsulated by Last Empire. While coins themselves are presumably very long-lasting as essence sources, they are exhaustible, and what remained of living world is powered exclusively by them: PCs travel into the Dungeon to get gold, but for survival, not a luxury, and not even their own personal survival but of their whole settlement and probably all of the living people. In the current document the aspect of PCs' obligations to their home Stronghold isn't touched upon but I can imagine that at least some of the initial gold has to be given away for PCs to have a place to return to from their travels. It is possible that PC ritualists are the last hope of their home, but in the absence of other information, the survival of the home Stronghold can be played as harsh or soft as DM wants it. To have a safe spaces PCs, in downtime, will have to create their own or extend their home Stronghold. Unlike in most of the games, where castle-buildling feels kind of tacked on so high-level characters had something to do to feel important, in Tenebrae you cannot even level up (your Mask) without building an appropriate shrine, which I think is very interesting, twice-indirect way to deal with XP-for-gold idea. The document gives a few examples of the what can be built but it can be expanded upon, and I hope it will be. There is a simple system in the document that is comparable to systems such as 'Into the Odd', 'Black Hack' or 'Knave'; if you favour another system, it can be easily translated. By my estimation the original system for Tenebrae is quite deadly, despite PCs having renewable Insight pool which they can spend to slightly sway their chances for the better. Stats are given equal importance, which I like for this setting, because however the character rolls they will probably be lacking in something, be it Wisdom (that affects AC), or Charisma (for saves), or Dexterity (for to-hit); PCs here are definitely not super-heroes-good-at-everything even with the Masks. At least initially, PCs are aggressively limited on how much of useful stuff they can carry (this is when Tenebrae reminds me of 'Veins of the Earth') but, as there is no armour beside what the Mask gives you, it is more manageable than it looks like. Gold is measured in the same Slots as everything else, so encumbrance indirectly is also the currency system. I am finding the description on Bow to be strangely detailed and when I read it for the first time, I misread it so 'Bow' looked like it describes any projectile weapon; I guess it can be very easily reskinned to be like gun or like a gun that Stronghold People call 'a bow'. One of the little strange things about Tenebrae is, as by the wording, the living rutialists don't have to eat or sleep to survive in the Dungeon. Rations are ritualistic meal needed for camping and restoration but aside of that, from worldbuildling point of view, people don't starve or fatigue in the Dungeon. I am finding this little detail quite unique. Is it because there is no time, in traditional understanding, in the Dungeon? Is this because of the Masks who made a living being more of the archetype than a purely flesh and bone entity? It is because PCs kind of die a bit when go to the literal underworld to fight various memories of various ages? Camping is a main unit of time within the Dungeon. Without need to eat or sleep for survival, and no sun, and the Dungeon being the underworld where memories of different ages mix and meld, it is a good way to keep track of time. From what I understand, there is no way to get more rations in the underworld of Dungeon (undead things don't sustain the living, and eating twice-dead-memory-denizens is, probably, not an option) so when getting their gear PCs already know for how many 'days' they can travel, and the loss of even one ration can be disastrous. A lot of the aspect powers also work 'until next camp'. It is a good system for this setting and ritual-survival mood. Aspects of Masks is another idea that I really like. It is ten 'spells' for each Aspect that emphases the Mask archetype, be it 'Rage' for Untamed, or 'Sneak Attack' for Knave, or 'Fly' for Arcanist. In the beginning PC chooses one Aspect and rolls for the second randomly (which, sentimentally, reminds me of Synergon RPG and its semi-random starting Skills), and can evoke either one of these Aspect once until next camp. With each new 'level' the Mask gets, it awakes one more random Aspect and gets one more time to evoke any known Aspects, in any combination and order. Comparatively to regular spells Aspects are somewhat stronger and I especially like how Magic Missile Arcane Arrow is handled. As of now, some Aspects look significantly more powerful than the others (Sneak Attack doubles damage on a certain high hit, lasts until next camp and it is unclear from the original wording if it supposed to work only once like that or with any good attack for all the duration). There is one named NPC and several other creatures, but Denizens section hopefully will be expanded. As of now, Barberians look a bit out of place but I think it is because there is not much else to compare them with. I really want to see Locales too as I wonder how the Dungeon will be organized, given that it is either endless or extremely, extremely huge. Will it be 'procedurally generated', symbolically built, built like an actual dungeon, something else or everything at once? Giving the scale and the nature of the Dungeon I think there will be at least some fluidity in the structure, but, on the other hand, Underworld of Exalted had a map, and cities, and quite stable environments, so I am curious to see how it is for Tenebrae. The writing is very terse and gripping at the start but grows somewhat loquacious later; this being a work in progress I am ok with it because if the latter pages at any point in a future get to be as good as the first ones, it will be enough. One little thing that struck me as odd is how in 'Adventuring Rules' section words 'narrative resolution' are used. To me 'narrative resolution' by default perception meant some kind of story-driven-game, where the result of the scene is what fits the bigger agreed-upon story or theme (and not the logic of the setting, the situation or the environment), but these words here are used to describe, basically, 'make PC say how and where they search, give results based on this and don't solve the search with dice rolls', which I found to be unusual way to speak about it. Probably necessary wording if people playing the game come from something like Pathfinder where you roll for pretty much everything. All and all I really want to see Tenebrae finished. There are a lot of potential and very strong setting/mechanic aesthetics here. Origins for the system behind the character sheet. All travels start from somewhere. The origin is the point from which everything else unfolds. It is the safe place. It is the wholesome place. It is nothing exceptional place, the place that doesn't yet know what ivory maze around godbox is. When hurt, tired, exhausted or brought down retreat to your origin. This is the person what wished to start the travel and however far your traveled since, they always stay with you. Here are some most common origin for the setting behind the character sheet. Human of Datay: you cannot separate yourself from hunger, not on the long run. Recover when you have a plentiful meal. Get a major recovery when you feed yourself with a life of at least semi-sentient creature. Human of Reo: your human heritage is your pride and accomplishment. By forgetting it, however briefly, you stop suppressing the natural instincts of your being. Recover each time when you are knocked unconscious, drunk into stupor or otherwise lose awareness of self. Get a major recovery each time you are able to go to sleep. Sleep is a human thing to do but yours is always black and dreamless. Human of Sagon: the world is moving, running, spinning out of control. Actively acting within it unsettles, jumbles and breaks you. Recover each time you can sit down in inner contemplation. Get a major recovery each time when you can rest and arrange your thoughts in a stable, quiet, safe environment. Human of Iriosa: a shell of a dream, you are worn down, scratched and tattered by the world. It wasn't so bad before and in dreams it still isn't. Recover each time you are able to go out of bounds of usual perception through illusions, horrors, drugs, artistic inspiration or another such non-routine events, unless you saw or experience them already. Get a major recovery when you are able to get in touch with dreams, your own or of others. Human of Talar: your origin lies in a society, within the complex, interesting and kaleidoscopic web of connections. You don't imagine human life in any other way. Recover each time you participate in a prominent social gathering (public speech, riot, carousing, festivals, high-society party, passionate gossip). Get a major recovery each time when you start and/or fund one of such activities. Normalcy: you were doing well in the world you understood doing tasks you were comfortable to do. Sometimes you miss that world. Recover each time when you are able to visit the settlement and immerse yourself, even as an observer, in the plain and simple life of regular people. Investment: there is no purpose in the world if you are unable to change it to your liking on a big scale. Get a recover for each [amount of currency] you are investing into some kind of enterprise that benefits you or somebody else you hold dear. Failure: whatever you did before, you failed badly enough at it, and this tossed you out of the previously known borders. Failure is your personal enemy. Recover every time when you successfully do an important task under pressure with risk of failure. Alienation: there is the present and there is a future and there is no past. Voluntarily or not but you had to leave it behind and didn't ever look back. The present has fewer and fewer connections. Recover each time you finish the important task or survive on your own, without any help. Crisis: Was it a revelation? A loss? A betrayal? Is the person remembering those events is still the same a person who had experienced them or is somebody else, just using the same skin and mind? Recover each time you are able survive the noticeably danger to your being or each time you lose a level. Origin here servers both in a race or important background event (such as failed career) that also sets how the character naturally recovers HPs and currencies of self (you still can recover through other means). 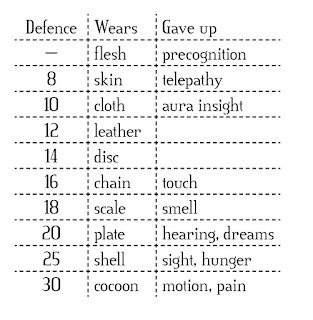 Each human origin mimics one or another recovery mechanic that I saw in the various OSR and other games: restoration by eating food, by sleeping, by resting, by carousing. Each 'personal' origin mimics some of the more exotic recovery mechanics mixing it with mechanics for getting XP a bit: return to settlements to rest and resupply, investment of gp [initially used for building castles, I think, but it can be stretched up to providing first aid to other people], success under pressure, solitude and so on; in particular the Crisis origin is Diablo-esque recovery where HP restores after pretty much any fight. I got the idea from elves, who rest in meditation (and so use the same breaks that humans do) but often in various settings and systems do not sleep. Usually dreaming isn't important enough in DnD games but I thought it was interesting how one race overrides it anyway. In Flailsnails, due to the nature of Flailsnails, the exact mechanics for natural HP restore might differ depending on the rules DM uses: snacking in one world restores HP while in another doesn't. Recovery and major recovery are taking from short and long rest of 5E which I am finding to be clear definitions (and because I had to rename everything here I am renaming even good definitions) but also, in a way, from Unknown Armies, with minor and major charges which there-mages receive by doing some their-magical stuff. I am wondering about an idea where you can 'save' an extra long rest if you have enough time in downtime, and then use it later. Even with such separation I suspect the human origins will work pretty well with each other, except maybe social one (although you can spend time gossiping and socializing within the party), as a lot of such origins would overlap in a downtime: when somebody is sleeping, another one is snacking or meditating. The second set of origins is more like backgrounds, the first is more like a race. I wanted the race/failed career to be something more than a bunch of bonuses and small abilities, which is why I connected it to HP recovery mechanics. I am not yet entirely happy with it and have a gut feeling it all should have more substance to it. 'Race' origins will probably also provide some small abilities, while other five, that are more likely connected to career and motivation, will have more or better starting gear. I think that wilderness is only useful to specific adventures and can be replaced in many other kinds of games. Speaking of wilderness I mostly speak about untouched by civilization vegetation wilderness (forests, jungles, hills, grasslands, swamps) and not extreme biomes such as deserts and rock mountains. My first postulate is that the smallest 'unit of setting', for the lack of the better word, is almost always a made structure – a dungeon, a city, a ruin, a building, a landmark. Even if in a forest there is an altar of root-god, made from roots and carcasses of animals without a human hand ever touching it or there is a hollow tree where fey lives, both are still _structures_, something that is made to have a certain (human or not) function, something where interesting things happen. Barring all of these kinds of places, the wilderness itself is amorphous and featureless, or, rather, having most of its features blended. On the map it is mostly a place that is defined by its borders and by points of interest (which are almost always a structure such as a settlement, ruins or some kind of landmark) within those borders. Pointcrawl is a type of play that especially navigates the wilderness between points of interest, which are usually structures. Why the wilderness exists, when we speak about the setting of the game? • It exists as 'blank history paper' for more history to happen when borders of civilization has to be expanded (royalist rebels run into forest, merge with beasts, fight back, eventually overthrow the regime and create a empire of Beastbloods with the seat in the forest which is also now their citadel). • It is the place where enigmas and horrors can be hidden, to pull out (sometimes as deus ex machina) some unpredictable things, such as beastblood union above, without much complexity. If setting needs a mystic coming with never-seen-before-revelations, strange beasts or buried secrets, the wilderness is one of the common place to 'store' them until they appear to be known by the rest of the works. • To simulate complex RL wilderness mostly through random encounters. • To simulate the long dangerous travel and use of resources (food, time, wounds, nerves). • As a 'quiet time' filler area between more intense parts of the game such as dungeondelving. In computer games and RL it is also to give you strange vistas to immerse into setting more and know its deep beauty, but in tabletops it mostly loses this function because few people are willing to listen to long descriptive paragraphs, therefore such descriptions should be done well (both evocative and succinct) to work. There is another layer to it: the players' upbringing and 'skill'. By my personal observation the vast, vast majority of DnD players are of urban upbringing. Some from smaller settlements, some from huge cities, but few are immersed into actual wilderness to the point of being as intimately familiar with it as the rest is with the cities. When I see a forest I can tell very little about 'how it works' aside of what I read in books and from very rare travels through it; I mostly see such forest from urban perspective anyway, in terms of difficult terrains and paths. I don't know what most of the forest means, how different layers of it interconnect. When I am in urban area, I can say what is below my feet, where unseen streets go and what each sound is; I see a ruined building, I can have a pretty good guess what it was and what befell it just by looking at it. Even in an unfamiliar and confusing city I am not near as helpless as in the forest. Players learn urban environment by osmosis and at the end, I believe, they know a sort of language, to understand this environment and its features with much greater details than the wilderness where features has no much distinction. Their characters might know the wilderness but then it is mostly a roll of the die, not an actual interaction. As a result of such familiarity players instinctively have more 'tools' to interact with urban-like environments. From my (limited) experiments, the same random encounter monster in a wilderness almost never provoked people to use environment to the degree they used when in urban decay areas. Trees were to climb up and hide behind; the urban decay was to crush unstable walls onto a monster, to electrocute it with leftover cables, to lure it to chemical vats, to block yourself in small rooms. Most interesting was that the number of questions 'Is there [X] around [for me to use]?' noticeably grew when players dealt with urban decay environment in contrast to the forest. This is noticeable in old-school dungeons where players look for traps not by the roll of the die but by player skill and asking questions. I wonder – if aesthetics are not important and if a setting tone permits, won't it be more interesting to replace the wilderness with urban decay and over-structures-overgrowth to give players an environment with which they can interact more? In this system Defenses show how safe the character is from the hurt of the world. For now, it is best correlated to Armour Class. The higher defenses are, the less the character is vulnerable to the world, the more they are detached and disconnected from anything that world is able to throw into them. The flip side of the coin, is that the more the character is disconnected from the world, the less they are capable to perceive and interact with it. Beyond the highest defense (cocoon) there is no need whatsoever to roll saving throws as the character is a static object with no vulnerable mind or body. Here the type of the defense is not strictly speaking the same as physical armour, it rather shows the layer of general impedance between the character and the world. 'Disc' can be a full-body shield or an armour made of ceramic discs, plate can be of metal or chitin, 'shell' can be of concrete. 'Flesh' and 'skin' mean character's own flesh and skin, i.e. skeletons are all have precognition, telepathy and aura insight. 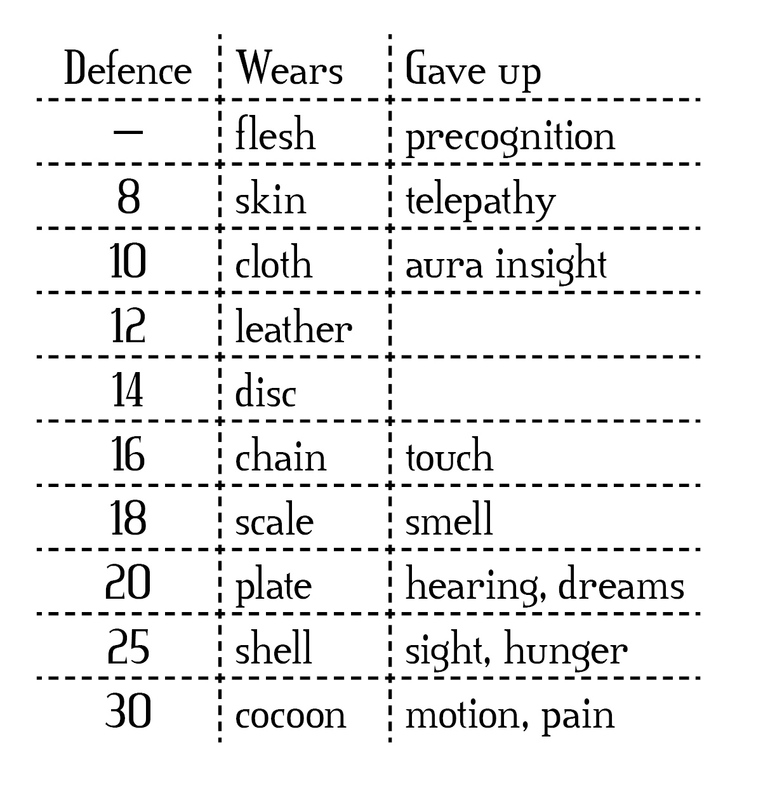 The chart is cumulative: plate defense makes the wearer to give up precognition, telepathy, aura insight, touch, smell, hearing and dreams. I don't know yet how to explain that some entities are capable to partially keep some of the senses and how some other entities lose more than usual. The working idea that certain paths adjust this chart up or down by one or more steps. As an optional rule the Defenses can be raised in any moment but never or almost never can go back down. So I have a character sheet and I have a half-remembered dream as a setting for this character sheet. Now there is a sort of a system as well. It is a long post and of interest primary to myself. I don't think it is going to be actually played anywhere. It is a mixed class/level-skill system because pure class system is tedious to develop and pure skill system has no defined character in its amorphousness. In a way it is a bit like WoD mixed into GloG with bunch of other things as additions. (Also, everything is renamed for no good reason, because the initial character sheet was supposed to be a heartbreaker where everything is renamed for better immersion into the game). Origin can be defined by a failed or successful career, by upbringing, by the species of birth/creation, by goal, by chance to name a few possible routes. Origin is what for the most people in the world is something self-sufficient and static. Player character progresses by expanding themselves from the point of origin but it always stays with them in some way. I have a raw idea that it also serves as a HP recovery mechanic (as in 'going back to the point of origin'), but I cannot figure out details yet. Aspects are Bones, Blood, Flesh, Reflection, Shadow and Echo. This is what the character quantifiable consist of as a being, and this is what other creatures want to have. Aspects are attunements to certain aspects of the setting, they can power up different kinds of powers, help or hinder different situations or to be used as currencies. Path is a rudimentary class that contains a sequence of about four GLoG-like templates and a capstone ability for the Path if there are all four. The Path only defines various abilities and there are no 'attacks as fighter, saves as cleric, HP as a mage' parts in it. Character can achieve about four-five steps that serve as levels for Paths, and the character can pick up as many Paths 'templates' as they can fit in these steps. Each Path 'levels up' in a certain way – for example, for ghost-eating occultist the initial step would be to die in the city of Ghest (where permanent death is possible) and battle the hungry dregs over their own body, while the third step would be to brand themselves with blood of a phantom darkbeast to open up Black Mirror Pathways ability. In a sense the steps requisites are opposite of dooms in GloG wizard system – it is something escalating and transforming that the character must actively seek out – to do, to survive or to inflict on themselves – to progress. Skills are the most straightforward, they allow the character to do various, more or less usual things better. Skills are in 1-5 range (see below why). I have a huge temptation for them to level up in a different way from paths, so the character can be level 6 and very good at doing certain things (say, fighting and knowing people) but cannot see ghosts or have any other special abilities because they didn't follow a path. I am debating myself on this because having two progression systems is usually an awkward thing to track. If it dual progression thing happens, the skills will level up from more mundane achievements – surviving challenges, exploration, overcoming violence, etc, and probably have a bigger range or levels, around ten. Skills are divided in four categories broadly derived from four dragons in 'Ryuutama'. I wish for each skill to carry at least a double function, therefore they are more abstract/symbolic than realistic, and being good at Traversal, for example, makes a character good at climbing and driving cars simultaneously. Traversal skill shows how well/fast the character goes through a terrain. If it is done faster by climbing it is helpful to climbing, if it is faster by driving car - then it is helpful to driving cars. Is climbing, jumping, swimming, driving all of them at once. Scavenging is about finding useful things that other people overlooked or discarded, be it food, shelter or clues in murder investigation; it is both survival and search skill. Available modes of perception – such as various modes of sight – are defined by origin, abilities of paths and defense worn, as a heavier defenses tend to shut off certain senses. Disable artifice is all about disarming or bypassing artificial obstacles somebody put on a way of moving forward, be it a lock, a trap or an falsehood which often leads to the same trapped situation. It is used to disable various devices and sense social motives. In each group the last skill serves a double role as a 'saving throw' skill, and Freedom is all about breaking from the situation when somebody wants to impede, stop, slow down or move the character somewhere the character doesn't want to be. It is rolled versus paralysis, petrification, stun and unwilling teleports. As a skill it also rolled to get freedom from shackles or squeeze through narrow places. Second group is dedicated to Links – communication, connections, social maneuvering and the necessity of relying on others. It is the weakest defined so far because right now I have difficult time to imagine how much of numbers I wish to put into social interactions. Handle is a measure of how well the character is able to pursue their goals in a situation where they have a advantage, parity or more or less equal circumstances with the parties they are interacting with. It is an aspect of diplomacy, haggling, trading, word-flourishes and long-term socializing. It also serves as Ride/Handle Animals skill or as measure of command when dealing with lessers. Connections is a measure of knowing people, what they do and how they relate to each other. It serves both as knowledge of local social life, streetwise and behind-the-scene manipulations. A character can also draw onto this skill to find helpful allies and contacts alike to WoD Allies/Connection backgrounds. Languages skill also serves double purpose. On one hand it is an amount of languages the character knows. On another hand, the language here is an essential bridge into another culture, society, behaviour, personality – language of love or hunger is still a language. This skill is used in fast-talking or in all social situations where the character is foreign to society they are currently in and/or doesn't have any parity or advantage. I am finding that communication with a boss (when I am in inferior position) is certainly different than communication with a friend (where I have parity), and skill of handling one situation well doesn't automatically makes second one to be good. Prestige is a measure of worth that the world awards to the character's desires and behaviour. Just as Freedom, it serves as a 'saving throw' skill to resist all influences that make the character's agenda to be subjugated to somebody's else agenda. It is most commonly used to resist charms, manipulations, geas, and other mental and social distortions. Prestige also defines the amount and a base morale of followers, although the character still needs to actually recruit them. Third group of skills is Violence – the aspect of the character that excels at dealing harm to others. Wrecking is probably the most direct skill that shows how well the character deals direct harm to others. It is BAB from 3.5/PF, and as such it isn't separated in Melee/Range/Thrown as in VtM. This skill also used to quantify the destruction the one brings to the unopposing aspects of the setting, such as objects or helpless victims. Cruelty shows how well the character is able to do an indirect and/or long-term harm to others without killing them. It is intimidate, torture and ruthless psychological subterfuge with explicit purpose not to guide or help but to twist the victim into something more pliable to character's wishes through fear and pain. Pursue quarry is skill that I know must be here but I cannot yet fully define it. Initially it was a skill to deal extra harm to certain groups, alike to smiting of classical paladins or favourite enemies of classical ranger, but the more I think about it the more I think it serves to isolate the target from all possible support like in slasher/stalker horror movies. Fervour used to survive pain, to endure and go on to the goal even if on willpower alone. It is a 'saving throw' versus poisons, fear, burning, all debilitating conditions, pain, elements, everything that deals any kind of actual harm. As a mechanic it doubles for 'phantom hit points' mechanisms like for barbarians and berserkers. The fourth group is Secrets, sometimes called Tragedies, that deals with unknown and how we use it, betrayals, vulnerabilities and fatum. Bygone lore concerns all information that is no longer connected to alive people (that would be Connections). Each successful use of this skill uncovers a bit more about things that either forbidden, forgotten or never discovered, mostly for good reason. Exploit weakness is about using an momentary advantage to bypass defenses and reach to the core, physical or mental. It is both assassination skill and healing skill. Used in certain way exploit weakness also ensures better loyalty of followers. Obscurity is facilitation of ignorance, absence and anonymity. A character dedicated to obscurity is easily unseen or easily forgotten; it is a skill of stealth, disguise and informational misleading (including burning books) which might also act as Arcana background from WoD, making people forget the character. Fate is 'saving throw' for everything that might be called luck, but, unlike luck, this skill signifies not a winning on a pure chance but a tightening of certain doom around the character. Used against or for divinations, god-like powers or everything from beyond understanding. Art (however you define or perform the art) can be created with any of 'saving throw' skills: Freedom creates experimental, foreign and unusual art, Fervor creates suffering art, Prestige creates appreciated art, and Fate creates some ineligible art that is the most messed up. Gear is kind of self-explanatory. Death are marks the Pain Saint leaves on the character upon each death and subsequent rebirth. It is a really long post and I didn't even mentioned what Heart Potential (HPs) can do. As a sidenote, I am finding the proficiency modifiers from 5E to be set in a near-universal way. – comparable with 'Cats' system for 1d6/even-odds (a variation on WoD). Mechanics where the '1-5 range' cannot be used are Roll&Keep and 'parameter = dice size' although it can be tweaked for these, but even without these mechanics, using this scale allows to make the system almost system-agnostic while having actual numbers. in tabletop game which aims to emulate a computer game, and still don't get used to death. Simplest, most obvious way. Usually some kind of stat or counter that goes down each time the PC dies and once it is zero, the PCs is no longer playable (died forever, became hostile NPCs, etc). Raising this stat is either impossible or difficult. Games like "Dark Souls TRPG" simply limit the counter to three – three deaths and game over. AD&D made PCs to lose either level or Con permanently forever. "Fires Far Away" gives more thematically elegant solution of sacrificing either of three given memories and/or name before turning into NPC, with opportunity to sacrifice a rare item instead (see #6 below). Another game have Humanity stat that almost never goes up but rapidly decreases with each death. In one novel there were humans, descendants of immortals, who could die nine times and everybody knew how many times they still have because a strange bracelet-like-birthmark appeared on their arm with each death, up to nine. Pros: it gives a defined limited pool and somewhat mitigates the permanent end of the PC life due to bad luck. Death can become a part of planned strategy. Cons: decrease of tension at the beginning of countdown. Predictability (= possible boredom) similar to how dying was handled in DnD 3.5+PF where the priest didn't have to bother running and healing downed comrade because both know exactly how many rounds they have before downed person dies. Suggested use: in playtested systems. Larger "deathpool" for more lenient stories, smaller for one-shots or for hardmode. Random chance to fully die at any occurrence of death. Even in Dark Souls with its infinite computer game lives it is very possible at some point to be too stressed or frustrated to quit forever or break the controlling device. In AD&D something like that was represented by System Shock percentage but there it was still predictable as it was tied to Constitution, so I would suggest to make it a coin flip or give something like 65% chance to everybody to die/survive, depending on how difficult you wish it to be. Optionally modify for terrain and monster (i.e. in poisonous swamps which are so generously spread through all three games or with anything connected to Bed of Chaos I really wanted to go and play Stardew Valley rather for a lot and so I did). Pros: gives some leeway with dying without (much) decreasing the tension, as each death can be the final one. Equally kind/merciless to everybody. Prevents cheapening of death with resurrection spells when PCs are powerful and wealthy enough to have them at mass. Cons: still out of control of the player. Still not very interesting as a process. Suggested use: in systems where resurrection spells might become easily available later on. PC dies. DM plays anthropomorphic death incarnation. PC wants to go back to life and is willing to try to persuade the death to let them do so. Instead of death it can be a mysterious priest, a devil, the devil even. Could be and maybe should be systemless, at my opinion, as a pure or almost pure roleplay. Pros: if people are into role-playing such kind of bargain, it can be a lot of fun to play. Additional quests, curses, brands, geas, all kind of stuff can be added as a part of the process as well as Tarot cards or some other sinister props for immersion and effect. Necromancers and various death-connected occultists get a new interesting aspect to their class as mediators for deceased. Cons: charismatic or clever players can dominate a meeker DM in such bargain, especially if DM already likes their characters and wants to see more of their adventures. The bargain might go for a while in real time, with a spotlight on a single player, so other players might get bored. Can be trivialized, eventually hand-waved or even turned into a joke. Setting requires to have some kind of psychopomp or an anthropomorphic personification of Death for this option to exist. Suggested use: if you are sure that as Death-DM you won't let PC easily have their way. If your setting allows for other PCs to chime in in the process of the bargain; in TPKs. In the first game I've ever played each PC (and probably each NPC as well) had two 'afterfirstdeath' forms (one of necrotic creature and a subsequent one of a specter) before they fully die. Considering that in that game 'Raise Death' spell was available about nine times per life of the priest and the spell only moved the PC one stage 'up', there weren't much clerics willing to cast it just for money so the consequences of dying were still quite tangible. These forms were, basically, built as templates: a bit like druidic wild shape in sense that there were rules how to build it, and each such form had its own unique abilities, strengths and weaknesses. A similar but more gradual approach is to give some kind of 'death touch' gift (ability + weakness) on each death. It is similar to countdown but probably more interesting than countdown because with each death something unexpected is happening, almost as with random level up. The overall effect of multiple dying is debilitating, of course, with end result the character turning to some kind of NPC undead creature similar in mechanics on how corruption works in AD&D Ravenloft or in mutation tables everywhere. Pros: if death gift tables are built well to bring small benefits and not only sheer drawbacks it can be a quite interesting process and, while debilitating on a long run, in short-term it can be even beneficial and less frustrating to PCs. Countdown is still here but not as boring or straightforward as a simple countdown. If death has several stages instead of randomized 'death touch gifts' PCs might get very inventive with their new shapes. Cons: PCs might want to start dying more often to get perks. Spiral of death (when drawbacks start to overweight benefits). Recalculating abilities more often than with usual levelup (= more bookkeeping). Loses meaning if resurrection/cleansing/atonement spells are quite available. Suggested use: if you have fast clear rules for afterfirstdeath forms so to apply them quickly. If you have or can make good tables for 'death touch gifts' and like rolling for random mutations. Approach I saw in 'Exalted'. There PCs are very powerful comparatively to normal people and fight gods and demons on almost regular basis but the death is permanent for everybody. This way positions that there is simply no ways to raise a character once they are dead, on any level of power. In 'Exalted' dead PC can technically play a ghost of themselves (similar to #4 above, a separate being generated by different rules) but comparatively to the power level of alive characters, it is a much weaker creature. Pros: death is very very tangible but due to how powerful PCs it is almost always more satisfactory and/or dramatic than being poked to death by first level nameless monsters or be one-hit by a small town guard in bar brawl due to critical and low HPs. Cons: In 'Exalted' there are custom charms, and powerful PCs might have a lot of resources to try to invent Raise spells, therefore some DM control is required and grumpy players can happen. Cannot be used in grim and low-level settings. Suggested use: high-level play where there is no 100% chance to win every encounter. Death is permanent but preventable with certain rituals which 'redirects' it on another living creature or rare object. If to speak in Pathfinder terms it is almost like Raise Dead on Contingency but I think it might be especially effective if PCs are duped or almost duped to be scapegoats themselves at first, or have people they care about to be used as such before they have access to such method for themselves. Only one 'scapegoat' can be linked to a character at the same time.The roots of this method in my memory go at least as far as a myth of Alcestis who was willing to die for her husband (and then Heracles got 'bargain' with Thanatos) but there are probably many other myths like this one. Pros: the rarity of scapegoats (be it special people, items, ritual components) is fully controlled by DM and their existence or accessibility is not guaranteed. Requires preparation. PCs or NPCs can still be killed if they die a second time before preparing another scapegoat and their enemies will know that. Cons: PC might find a way to 'farm' the required resource – in live game it is going to be more difficult than to farm humanity in Dark Souls but is still possible without DM control. Suggested use: never ever ever equal the rarity of scapegoats to increased gp value. Probably best suited for 'evil' parties. For moralistic stories, dramatic stories or domain-level plays. Probably the weirdest and hardest to handle way, is to reset the time to some threshold in the past and assume that this is now a different timeline where events go slightly differently than before to save yourself a headache to reintroduce everything in exactly the same way as it was before. PCs will lose some progress. Pros: it gives PC(s) some foreknowledge (which might be not 100% precise) to influence future events and people tend to get inventive with such things. Carefully used alternative timelines can instill a good sense of paranoia or create a mystery that by itself may be interesting thing for players to solve. Cons: it is pain to erase the progress and technically almost no systems are built to "leveldown" easily. Pain to remember which progress to erase. Pain to remember how everything works. Probably requires flowcharts. PCs who didn't die but still have to reset their progress due to time loop won't be very happy. Suggested use: if setting or story logically allows this kind of stuff. Probably not in fantasy but in modern occult, surrealism or SF. In TPKs. In one-shots, in systems where level up and level down is easily traceable and/or modular. The setting for the character sheet. Recently I've made a overly ornamented character sheet for purposes of system and/or setting to be reverse-engineered from it. I thought it could be a fun thing to do for people but, as it still just kind of there and not being used, I will attach some random suitable dream to it as a setting. The box is delicate and ornamented. It has no lock. There is a cage around the box. The cage is forbidding and painful. Metal barbs outside, metal barbs inside. The cage has no door. There is a maze that outgrows from the cage. Maze of living iron, and bone ivory, and gold, and crystallized human liquids. The maze grows in all directions. It keeps on growing. The maze has great many entrances but only one exit. There is a city on the outer 'crust' of the maze. It is the city which looks intricate but human, with human-sized streets, and human-like litter, and human-like noise. Travelling through such streets for a long time and going down reveals the streets that are different, with doorways too big and narrow and remains that are unusual. At first there are still humans, tucked into this architecture, adopting it for their human ways, but quite soon they change and then they go away. And after travelling for the even longer time, down and down, through gloom, and silence, and inhuman architecture, the traveller appears again on sun-lit human-sized streets under the sky, regardless how deep they had gone, as if the space resets itself back to the outer level. The city has no purpose. But in a box, that is in the cage, that is in the maze, that is in the city lies the sense for all existence. What was interesting in the dream that you cannot really die in the maze, as Pain Saints (the constructions or creatures of living metal, bone ivory, crystallized human liquids and gold with improbably humane eyes) will resurrect you, often leaving you with a 'blessing' of sort, which is working quite well with whatever middle-right section of the character sheet is for. Here are some thoughts about Emmy Allen's post about orcs. It has nothing to do with any of certain worlds or game content itself and it is probably moralizing as well. I thought about posting it in any of two actually relevant threads but I think I now officially chickened out on this. However I might object to the idea of violence, I cannot deny that violence in games (both video and tabletop) can and often does feel good. When I pressed shoot button in the original 'Doom' for the first time in my life and saw the just-menacing opponent reduced to a splatter, it felt pretty good and it still does. I think such action and following victory triggers something in hunter part of hunter-gatherer part of the brain, something that humans are probably hard-wired to feel, especially when they are allowed, by the rules of the game, to win. Videogames especially often provide violence as both feel-good and time-effort optimal way to solve problems. Partially it is because of the limitations – it is much easier to create a good shooter/slasher than a complex nuanced world, and with the latter sooner or later it is going to feel fake anyway as it hits its programmed limits. In addition, the violence in video games is almost always consequence-free – to my memory, only three recent games (Spec Ops The Line, This War of Mine and Metal Gear Revengeance) tried to do anything with how consequence-free the game violence is, however small the effort was in the last case. In the absence of any meaningful consequences, the violence often is the quickest, the optimal and the most satisfactory way to solve the conflict, challenge, hostile situations, any kind of obstacle. In addition, in games with any gunplay and swordplay these aspects are intentionally designed to look spectacular, be engaging, 'have weight', have visuals and sound feedback satisfactory to the player to participate in acts of combat; also the player character often has no other abilities but to combat and to combat-support, sometimes they cannot even talk. In such games I don't feel guilt playing within the extremely narrow limits using extremely limited tools the game provides because I literally cannot do anything else aside of turning the game off. Framing of the violence as heroic or unavoidable (as it is in so many videogames) helps but even if the actions of my character eventually presented as villainous what options do I have aside of not playing a game? Can I spare faceless soldiers in Metal Gear Revengeance after I hear their scared thoughts? I want to but I can't. If there was a bloodless stealth option after that scene I would use it but there wasn't one so I kept on slicing. In tabletops the combat is much abstract, without visual/audible/quick button input component, it is slow and doesn't have the same flow of quick situation-reaction challenges as good videogame does; the biggest gameplay satisfactory feedback is probably rolling a handful more dice on criticals, seeing DM's face when you tell them your damage modifier or hearing the cheer or awe from other players at the table. In addition, GM, having no limitations of a computer, can come with any tonal or setting consequences for excessive violence they wish. But it is still a feel-good feeling to dominate the situation in quickest and most finite way. This satisfaction in games is something that real life almost never gives us in any way, as there are always consequences and there are always compromises and we rarely have so utterly an upper hand that the problem is not solved but erased. Real life provides especially heavy negative consequences for the violence, while a game very often only rewards it. I think this is where Always Evil opponents in tabletops come from. Acceptable baddies to feel good exterminating without a thought in addition to more nuanced freedom that the tabletop game can provide through live DM without computer limitations. And the more human-like these enemies are, I believe, the more satisfactory is the hard-wired feeling of victory over them evokes. Defeating demonic pile of tentacles and solar lenses is more when it also has a recognizably human face that can understandably express pain of defeat on top of it. But because tabletop games are guided by actual humans and have much more freedom in them, it always feels somewhat fake to me when there are a lot of consequences-free violence in the world more fully realized than in videogame. Like this is a part of a videogame with its very limited tools and very narrow constrains grafted into otherwise alive and realized world that is tabletop setting. But violence in games often feels good. Its absence or when it is complicated by real-like consequences can diminish this feeling of feeling good. And people are coming to games mostly to feel good. The first ever setting I created had no intentional violence, but people didn't want to play it as it was boring to them. The second setting had no Always Evil targets, not even as demons, and people didn't feel good on weekend nights they came to have fun. I think unless people intentionally agree to abstain from violence or at least from the violence as the best/first/quickest tool to solve the challenge (as in Ryuutama or games with especially lethal combat/RL-like consequences), acceptable targets are assumed to be somewhere in the world by default to give the sense of satisfactory victory. This said, I am happy that orcs are becoming less Always Evil fodder and are given more space to be people instead, however messed they are right now as people. I saw a notion that orcs should be unhumanized back into some un-understandable eldritch monstrosity, but I think ever since Tolkien it was already too late for this because even in his works orcs had humanly understandable looks, behaviour, ambitions, thoughts and memories; they already were people in everything but their designated role in the story. That Always Evil orcs in particular are almost always un-beautiful and mostly dark-skinned humanoids that are portrayed as incurably aggressive and non-variations evil doesn't sit well with me for a number for different reasons as well so I can only welcome the notion of them as more complex people, however yet messed up.